AMC's Great Kids, Great Outdoors: FoodCorps: Beginning the Food Revolution? FoodCorps: Beginning the Food Revolution? Late last month, as the school year was beginning in Massachusetts, 6 young adults prepared for new jobs in Lynn, Gloucester, and Boston. They attended a training and orientation session. Nothing special there, right? However, their employer and the work they were preparing to do are unusual, indeed. They might, in fact, be a way to solve many of the difficult issues surrounding food and childhood. We know these problems, and know that they’re knotted tightly together: Childhood obesity has more than tripled in 30 years. Many low-income communities are “food deserts,” where healthy food is difficult to find and expensive to buy. Those communities often also lack green spaces where children can safely play and exercise. According to a recent article in TIME magazine, the cost of weight-related health problems is expected to reach $344 billion by 2018. Enter FoodCorps, a new national service program under the umbrella of AmeriCorps, which provides about a third of its funding. FoodCorps received more than 1,200 applications for its first 50 service positions — making it harder to get into than Harvard, note the program’s organizers. FoodCorps co-founder Cicely Upton has been working to bring healthier food options to children since college. Directing youth programs at Slow Food USA, she heard from teachers, food professionals, and parents that healthy-food organizers needed to professionalize their work. “We needed to be able to pay people to give it viability,” she told me recently. Recruiting volunteers on college campuses, she kept hearing from students that they were eager to work in this new field, but could find no entry-level jobs. FoodCorps solves both issues simultaneously. Six ground troops in the battle for that “healthy food environment” were deployed in Massachusetts this month. They’re working in classrooms, in school gardens, and with community members. 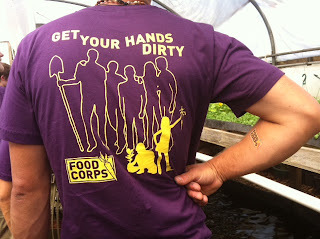 In my next post, I’ll describe the organizations that have laid the groundwork for FoodCorps in Massachusetts. ... Read about FoodCorps in a New York Times column and in a TIME magazine article.